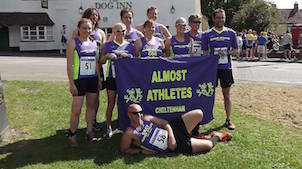 Anthony Bailey firmly secured victory at the Cotswold Spring 10K by leading the field throughout the picturesque but hilly route and coming home almost a clear minute ahead of his nearest rival. With over 60 runners, the club made its mark on the results sheet at the Forest of Dean Half and produced many personal best times. Leading the way throughout was Dave McGrath who managed a top 50 finish and with a time of 1.23.58 and 5th placing in the MV40 category. Hot on his heels was the ever improving Ed Collier who crossed the line in 1.26.05, securing 2nd place in the MV50 category.